Are you looking for personalized, custom name badges? 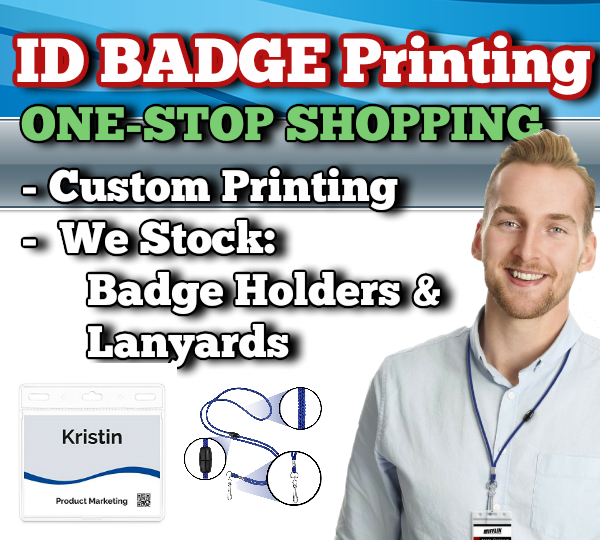 New York Printing Solutions offers ONE-STOP SHOPPING for custom ID badge design and printing. But we don't stop there! In addition to custom design assistance and printing, we can save you time and money by providing plastic name badge holders and high-quality lanyards. We can help you create the perfect personalized name tag for your event. Another exciting innovation is automated fill-in of badges! Just provide a list (Excel or CSV file) of names, titles, and other identifying info andwe will provide you with PERSONALIZED name badges.One-Stop Shopping for Name Badge, ID Badges or Name Tags. Make all your guests, speakers and exhibitors feel important with custom, personalized, printed conference badges and badge holders. We Can Print The Names, Title & Other identifying Data On Each Badge! Supply your own artwork for your badge template or ask us for assistance. If you want us to customize each badge, provide us with an Excel or CSV file containing the text to appear on each badge. That's it! Planning a convention, a tradeshow, a conference, or some other event? Have New York Printing Solutions print your conference name tags, name badges, and ID badge holders! Custom ID name tags and conference badges are integral to any trade show or conference, providing the ability to easily identify exhibitors, visitors, speakers and on-site staff. Imprint Plus ID badge printers allow you to custom print conference name tags, photo ID badges and ID badge holders for your conference or convention attendees, enabling them to improve their ability to network with others and build invaluable connections. Custom name badges and personalized name tags identify you and create a positive first impression. Custom, personalized name badges and tags foster networking. Customized ID name badges and conference badges are an important addition to trade shows and conferences, providing the ability to easily identify exhibitors, visitors, speakers, and staff. New York Printings Solutions provides the ability for you to custom print conference name or ID badges, photo ID badges and ID badge holders for your conference or convention attendees or exhibitors, allowing them to greatly enhance networking and fostering invaluable connections. Think New York Printing Solutions for when you need custom, personalized name badges, ID badges or name tags. Durable Easy-To-Load Name Badge Holders & Safe-To-Wear-Lanyards No zippers - just slide in your name tag. High-quality cover stock paper, durable name tag holders and lanyards. Our lanyards have a special "break-away" feature assuring safety to name tag wearers and young children whom may come in contact with them. Standard turn around time is 3-4 working days, but RUSH Service is available for an additional cost.